Type in a swear word (Such as the 'F' word) and the game will mention Leisure Suit Larry. While in the whale's mouth, take the bottle, get the note and read it to get a reference to various Sierra games such as "SOS! I see a beautiful mermaid in KING'S QUEST II but she won't help me! Tell me what to do!" or the one shown below. Look behind the tapestry on the wall next to Gwydion's room to find a reference to King's Quest IV. - "a hull-hole detector for finding those hard-to-spot holes in small sailboats", referring to the sailboat in King's Quest V.
- "cat-cookie mix. ", referring to King's Quest III. - "a golden bridle finder, for those nearly-invisible golden bridles", referring to King's Quest IV. - "self-adhesive emeralds, what you use when you don't have honey", referring to King's Quest V.
- "tongue climbing gear, testd on over one hundred whale tongues", referring to King's Quest IV. - "a uvula tickler", again referring to King's Quest IV. - a Cheese hook, for retrieving cheese out of small holes", referring to King's Quest V.
- "a shovel that's guaranteed not to break for over one-hundred grave diggings", referring to King's Quest IV. - "a bridge repair kit, for when you've crossed a bridge one too many times", referring to King's Quest II. - "stair traction pads: stop slipping off those narrow staircases", referring to multiple previous King's Quest games. The music in the Software store is a compilation of the themes of King's Quest 4, Quest for Glory, Space Quest and Leisure Suit Larry. In the death scene where Sonny gets locked up after randomly shooting around, there is also a picture of king Graham of King's Quest IV in the newspaper. At the end of the game, Larry and Patti end up in the studio of Sierra Online. After passing the set of Police Quest, a room with gadgets (referring to the Black Cauldron, Manhunter, Larry 1 and other Sierra titles), and the Space Quest set, they meet Roberta Williams who is shooting the whale tongue scene of King's Quest IV. 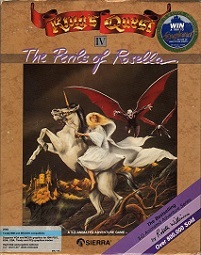 Go into the stable and type "Bridle horse" to get a reference to King's Quest IV. While on the dance floor, walk to the man at the table below and LOOK MAN for a reference to Chris Hoyt, King's Quest 4 and Laura Bow 1. - The "M" from Monolith Burger in Space Quest 3. One of the items in the magic shop is a hand doll resembling Rosella of King's Quest 4. Next to it is also a Cookie Monster Puppet from Sesame Street. 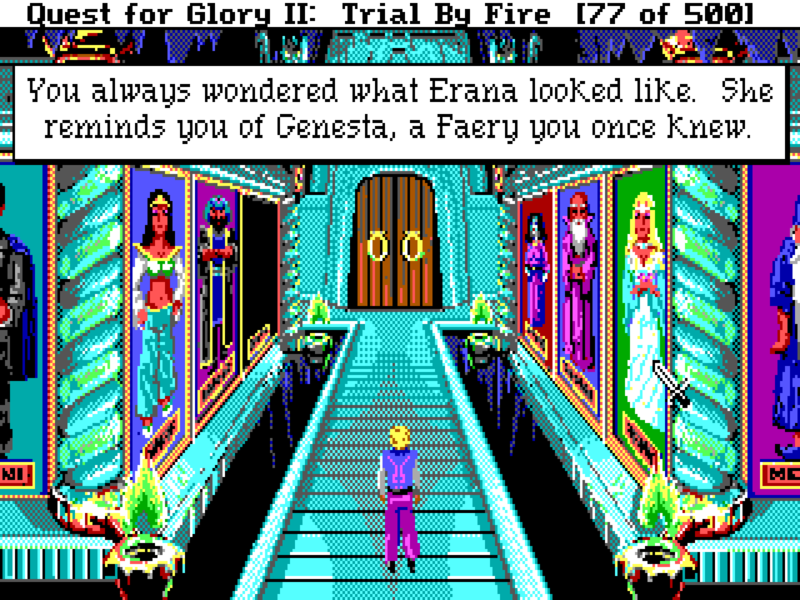 In the WIT's entrance hall, look at the image of Erana - she looks like the fairy Genesta from King's Quest 4. The peacock in the forest maze is from King's Quest IV, where it can be found on Genesta's Island.